The self-proclaimed greatest alchemist in the world, and ruler of the largest Empire ever to grace the continent of Empyrean, Friedrich I, had unlocked the secret to not only creating artificial life forms or homunculi, but also engineering them and augmenting them to perform certain tasks far better than a typical human could. Naturally, he used this magical science to create an elite, highly skilled, superhumanly strong and magically augmented personal guard unit. Using a secret technique to enhance them and train them, each of these young-looking girls would eventually qualify to take a practical examination in order to earn the feathery wings of an angel in order to become the most elite of the Imperial Guard. Today was the day of Haia's examination... an adorable young guard who got along well with her creator and her fellow guards and maids who tended to the Imperial Palace. After fueling her up along with her big sisters Saori and Fenna, Friedrich stroked her soft hair and said, "Are we all ready for Haia's test? Go ahead and select your armor and weapons... remember, our enemy is a black dragon. Their breath weapon is acid, and they're resistant to direct damage magic and non-dragonbane weapons. Force multiplier magic should be very useful for the upcoming test, though." Last edited by Holeypaladin; 08-15-2018 at 02:29 AM. Excited for her test despite the potential dangers, Haia could hardly stand still as she listened to the Emperor's important reminder about what could and could not be used against the black dragon. 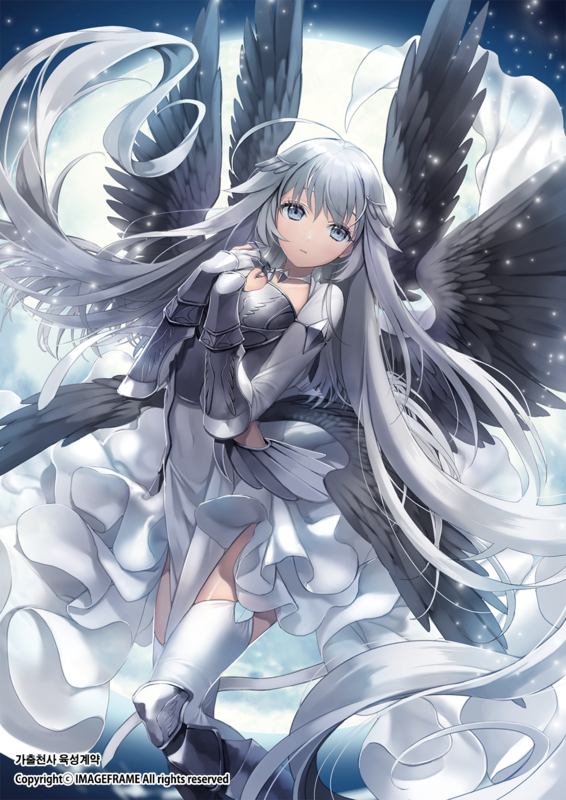 With the help of her two big sisters, as well as Friedrich if necessary, the wingless guard was confident she would be able to pass her test and earn the beautiful angel wings that she had been practicing so hard to get. She couldn't wait to become a true part of the Imperial Guard, and fight alongside her strong big sisters. Once given permission to get their armor and weapons, the little guard quickly approached the weapons table alongside her big sister, Saori. The more experienced guard made sure to select dragonbane weapons, just as the Emperor had mentioned, and also helped her little sister properly secure the protective armor on her body. "Just remember what you've been taught, and make sure you listen for instructions from Fenna-chan and I. But I know you're going to do just fine," Saori finished up a little pep talk for the young guard before the three girls returned to Friedrich with the weapons and armor all picked out. "Haia is ready to go, Goshujin-sama!" the wingless guard chirped, still bouncing on her toes as she made it to his side. Although there were a bit of nerves hidden beneath her excitement, Haia knew that the Emperor and her two big sisters would keep her safe no matter what. Glad to see little Haia's excitement, the Emperor chuckled and watch her approach, examining the various weapons. "Make sure to wear something you want to flash to Daddy, too," he reminded them, figuring the girls would appreciate the chance to flash their various undergarments or lack thereof under their short armored skirts while they fought against the dragon and maneuvered around. Gazing at the way the excited young guard bounced and said she was ready to go, the Emperor realized she was being a bit hasty to rush into a dangerous situation. "Glad to hear it..." he said. "You'll want to use your wonder twin telepathy to coordinate with each other during the battle. I'll be there to make sure no one gets hurt, but if I have to step in and help, you'll have failed the test, since you're my guards rather than the other way around." Giving a soft kiss to the young guard, he reached out to stroke the feathery wings of Fenna and Saori as well. "What weapons did you girls decide to bring with you for this test?" he asked them, as if to remind them to be sure to bring weapons that would be useful in a dragon hunt. The three guards listened intently as the Emperor spoke, always being sure to listening closely to the man's words as to not fail him in any way. They even helped to ease the excited little guard that was bouncing next to him, since she seemed to realize it was time to focus and get serious so she could do well on the test. "Haia will fight well for Daddy. He won't have to help. She can keep him safe!" she promised, eagerly returning the gentle kiss that he gave to her. The two big sisters were watching the little guard with admiration in their gazes, especially Saori, since she had been the one to train Haia into the little guard that she now was. As Friedrich addressed the two though, they each smiled and raised their weapons for him to see. "Fenna chose her sword, since she fights the best with it," Fenna explained, having always been one to prefer swords over other types of weapons. "Saori picked a polearm...and she gave one to Haia as well," the big sister told her weapon choice as well, hoping the Emperor would be pleased by their decisions. "We've also packed various poisons to try out... in case they may come in handy," she added, having decided to bring some along in case it helped Haia during her test. Gazing at Haia and unable to stop himself from smiling at how incredibly adorable the young guard was, Friedrich nodded and stroked her soft hair. "I'll be looking forward to seeing how strong and cute Haia has become from training so hard," he said to her, watching as the girls each selected their weapons. He nodded to Fenna, kissing her tenderly and stroking her soft wings. "Is that the long sword with the explosive pommel?" he asked her as he looked over the sword. "You plan on ending the dragon rightly, then?" Fenna's pommel grenades had become quite famous among the young guards, so it was no wonder that Haia had picked her to accompany her on this test. 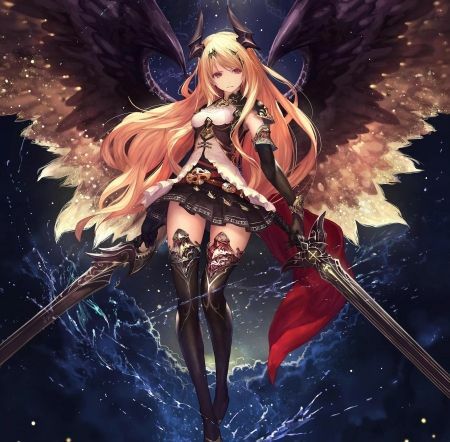 Looking over the polearms that Saori and Haia chose, he nodded to the older sister of the young guard, stroking her wings and giving her a soft kiss. "Good choice," he said with a nod of approval. "You should also bring arming swords for backup weapons, in case you get disarmed." As powerful and effective as polearms were in combat, a dragon was still more than strong enough to wrench them from the grasp of the superhumanly strong guards due to its massive size. Once he was satisfied the guards were ready, he said, "Alright then... if all of Daddy's good little girls would gather around him..." He wrapped his arms around the three guards before incanting in the Draconic language, "Sehlek, svih, karif mojka." In response to the magic spell, the space around them warped and they were no longer in the Imperial Palace, but instead on the surface world, in a dank swamp. "The dragon lair is nearby," he said to the guards. "I can no longer provide any assistance... it's up to you girls to keep me safe for the rest of the test." As the Emperor inspected the weapon choice of the guards, the girls all smiled as he seemed to approve of their choices. His comment to Fenna even earned a soft laugh from her, and she nodded her head to confirm his assumption. “That’s the plan, daddy. Femna will end the dragon rightly,” she agreed, another soft giggle leaving her lips. The other older guard was also humored by the man’s words, but smiled as he seemed proud of her choice of weapon as well. Upon his suggestion, the guard did go back to grab an armong sword for herself and Haia, deciding it was definitely a good idea to have some backup. “Thank you for the suggestion, Goshujin-sama,” Saori said once she returned, handing the shorter of the two swords to her little sister. Having all their weapons gathered, the three guards huddled close to Friedrich as his arms went around them. The three girls listened as he chanted the Draconic words, and then watched the world around them warp and shimmer as they were taken directly to the marshy swamp that homed the black dragon. Hearing the man speak, the two older guards nodded to Friedrich before Saori reached out to give Haia an encouraging nudge forward as they started their journey through the murky water. "The dragon will likely have traps set to protect its lair... Do you remember which spell can help you find them?" the older sister guard asked, wanting Haia to show off the things she had been taught during her training. The wingless guard gave a small nod in response, quietly murmuring the Divination spell that would allow her to detect snares and pits, figuring that those would be the likely traps set by the dragon in the muddy swamp. "Very good, Haia," the older guard praised, giving the young guard's head a gentle pat. The encouragement built on the confidence of the now nervous little guard, and she started to guide the small ground through the swamp all while avoiding the many traps set by the black dragon. Reaching out, the Emperor stroked Fenna's feathers as a way of praising her for having such a unique combat tactic. Most enemies wouldn't consider a thrown pommel to be anything more than a nuissance, as it wasn't a very effective fighting technique and rather humorous in concept... until the pommel exploded like a holy hand grenade after counting to five, of course. "Fenna is a good girl," he said to the guard as he stroked her feathers. Listening as Fenna reminded Haia of some of the lesson she had received in her dragon hunting classes, he watched as the young guard incanted a Detect Traps spell. "Haia is a very good girl, and has a clever sister," he said, kissing Saori's feathers softly. He walked with the girls as they headed through the swamp, not stepping on any of the tracks himself. While the winged guards could have easily just flown over most of the traps, since Haia didn't have any wings of her own yet, he wasn't surprised that her sisters chose to walk beside her rather than flying over her. He smelled the wyvern before he saw it, as it was quite well concealed in the swampy terrain and in a good position to ambush the girls. An ordinary human might have stumbled into the ambush without know about it, but he had given the girls enough heightened senses that they should have no difficulty in hearing, spotting, or smelling the wyvern and its three kin before they were completely surrounded by the dragonkin beasts. Getting praised by the Emperor caused the wingless guard to smile, but she didn’t take her focus off the task at hand. Saori also smiled at the compliment from the man, and her feathers quivered a bit from the kiss he placed on them. “Thank you, daddy,” the guard whispered, glad to see the man pleased with her and Haia. As they began to make their way through the swamp, the three girls remained silent in order to listen to their surroundings and focus their attention on finding the dragon’s lair. Fenna was the first of the guards to start slowing down as the scent of the wyvern reached her nose, but the more experienced guard wanted to see if Haia could catch on to the scent before the beasts could attack. Of course, Saori was quick to pick up on the scent, but it wasn’t much longer until Haia slowed her steps and stopped walking completely. “Wyvern,” the little guard whispered, clutching onto her polearm as the other two guards nodded. "I believe there's four of them... Fenna can take one, while Haia and I handle the other three," Saori began to speak with the other two girls through their telepathy communication, knowing that she and Haia could handle the youngest three wyverns while Fenna handled the larger, older one. After having a bit of a plan formed, Haia cutely motioned for Emperor Friedrich to stay where he was, so he could remain a safe distance away from the fighting. It was then that the two guards with wings ran forward before taking off, their angel wings lifting them into the air while Haia scurried forward on foot to keep up with them. The wyvern and its kin chose that moment to make their appearance as well, the three younger wyverns following behind the larger as they came out from hiding among the forestry surrounding them. As Fenna went for the largest of the four wyvern guards, she placed an Enchantment Static Blade spell on her longsword, hoping to give herself a bit of an advantage over the large beast. Since the forestry prevented the wyverns from flying too high, the much smaller girls had a small advantage in the air, causing Saori to swoop down and pick up Haia, carrying the tiny, wingless guard with her as she flew towards the three remaining wyvern. Fenna dove through the air directly towards her foe, using both hands to slash her sword across the wyverns shoulder, and send a jolt of electricity through its body. The large wyvern, although it was quite agile, was not quick enough to lash out at the guard despite whipping its tail around in an attempt to do so. The beast roared as the swift, angelic guard continued to fly around it, occasionally dipping lower to drag her sword through its scaly flesh. As reasonable as Haia's request for him to stay behind while they went ahead to fight the wyverns was, Friedrich wanted to watch the fight so that he could properly analyze it and give them feedback later on, since she was to be graded based on her performance. So he instead left a mirror image of himself where he was standed while he proceeded forward under a spell to mask his presence from the wyverns. 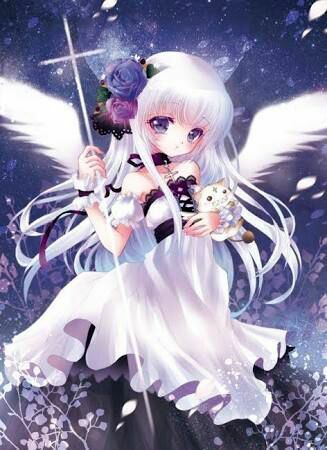 Besides, it allowed him to get a good look up the short skirts of Saori and Fenna as they took off into the air, which he took full advantage of, enjoying the view offered to him by his beautiful young guardians. Following after Haia on foot for a time, it wasn't long until her sister came back for her, lifting her, too, into the air in order to give him a good look up the adorable young Haia's armored skirt along with the other two. He watched the violent struggle between the tiny girls and the larger wyverns, noting the way they used their small size to their advantage in outmaneuvering the creatures. The dragonbane weapons would prove equally useful against dragonkin as they were against true dragons, as shown by the deep wound provided by Fenna's electrified blade bit into the shoulder of one of the wyverns, immobilizing its wing and preventing it from flying while Fenna herself evaded the tail. All in all, they were performing quite well so far, though the true test of their skill at arms had yet to begin. While Fenna was busy taking on the largest wyvern, the two other guards fought off the three remainders. As Saori got them closer to their targets, Haia cast the Evocation spell Magic Missile in order to strike the nearest wyvern and continue to show off to the Emperor how much she learned during her trailing. The little guard's big sister then dove down closer to the dragon, keeping a secure grip on Haia while the youngest guard thrust her polearm into the tough, scaly skin of the wyvern. The two others were quickly approaching, and Saori, being quite a bit more skilled with magic than her younger sister, was able to fire off two Magic Missiles per wyvern, knocking them back enough to allow Haia to focus on the first wyvern for a bit longer. Due to Saori's quick and agile flying, the guard was able to help Haia avoid attacks made by the beast, and get the smaller girl close enough to pierce the wyvern with her polearm. However, the wyvern predicted the movements of the quick flying guard, and it made an attempt to bite down on the two little homunculae. Just as the beast's jaws were snapping shut, Saori was able to Teleport herself and Haia to the other side of the dragonkin, where Haia was able to land a fatal blow to the wyvern with her arming sword. Meanwhile, Fenna was still circling the largest of the four wyverns, occasionally finding an opening to swoop down and slice her sword through the skin of the beast. She was able to maneuver around the powerful attacking attempts made by the wyvern, until it's tail unexpectedly swung through the air, and clipped the guard just enough to send her spiraling to the marshy ground. She landed with a soft 'oomph,' her sword knocking away due to the impact. Although mostly unharmed, the guard was still a bit disoriented from the fall, allowing the wyvern to quickly approach her in her vulnerable position. The guard, quite frightened by the fast approaching beast, managed to sputter the spell to put up a Wall of Fire, causing the wyvern to knock directly into it due to its haste. This slowed the beast's movements tremendously, allowing Fenna time to scramble for her sword, and lift back into the air with a few steady flaps of her wings.